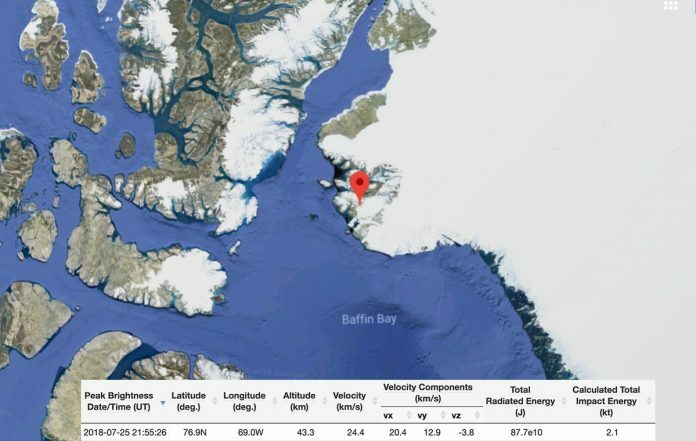 A mysterious fireball appeared in the sky over Greenland and an explosion similar to that of a small nuclear bomb exploded. Everything happened not far from the US airbase in Greenland. Information about what happened was posted on his Twitter account Ron Baalke, a scientist from the Jet Propulsion Laboratory of NASA. 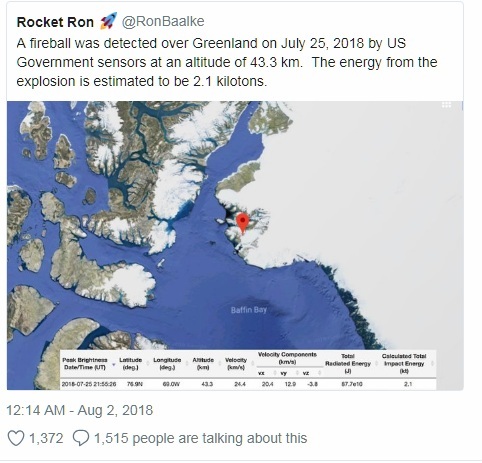 “The fireball was discovered over Greenland on July 25, 2018 by US government tracking systems at an altitude of 43.3 km,” he wrote. The energy from the explosion is estimated at 2.1 kilotons! 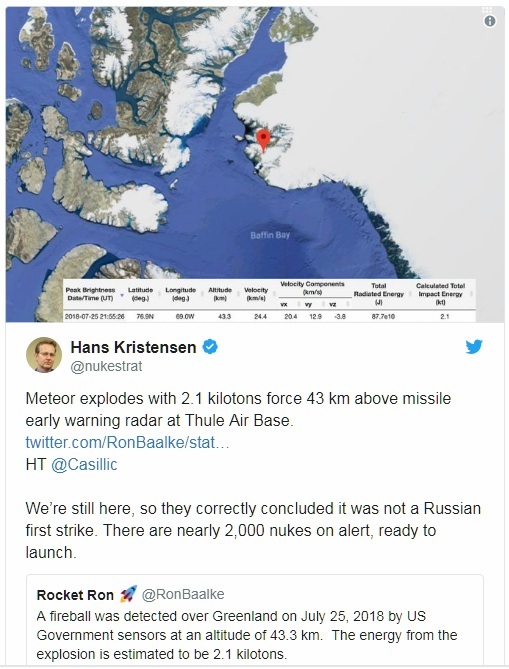 Hans Christensen, director of the Nuclear Information Project at the Federation of American Scientists, said that the meteor exploded “over the base of the early warning of a missile strike at Tula airbase,” the northernmost American base that has been operating on the island since the 1940s. Well, it is clear that it would not happen, but the Russians are always to blame. Not only the USA was lucky, in the sense that they are still alive-lucky all over the world that we are all still alive on this blue ball, since an explosion comparable to the nuclear one over the US military base could well become the trigger of a global nuclear war and then there would be no one to figure out what was the cause – a meteor or UFO or a comet.